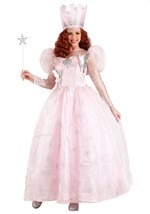 Grant wishes and make dreams come true this Halloween with this silver sequin Glinda wand. The shimmering wand has a shiny plastic handle with a sequin-covered fabric star attached at the tip. The wand measures approximately 16 1/2" tall with a 4" wide star. This Glinda wand is perfect for kids and adults. Add a pair of our Glinda shoes for a great Oz costume this Halloween.